I am a big fan of tailored details. I like them not just on jackets and coats, but pants, dresses, blouses, you name it. Welt pockets are a great example. They look fantastic on any sort of structured piece of clothing, anything you want to look really sharp and polished. In fact, I’m working on a cute little shift dress right now with welt pockets in front. The pockets we’re doing today are single welt pockets and they’re pretty common on jackets and blazers for both women and men. So here’s what we’ll do today. Let’s get started! 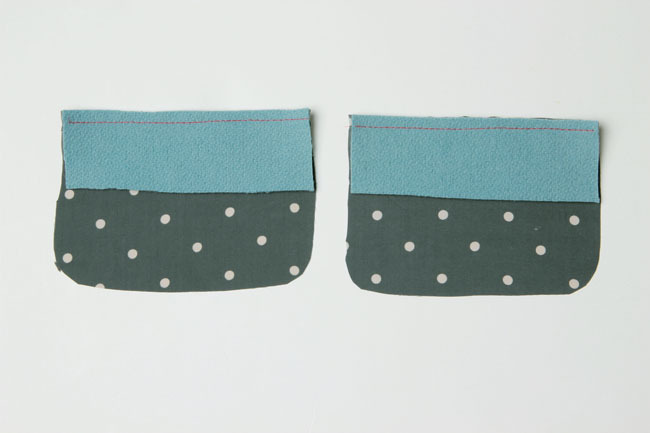 With right sides together, fold each welt (I) lengthwise and stitch short ends, using a 1/4” seam allowance. 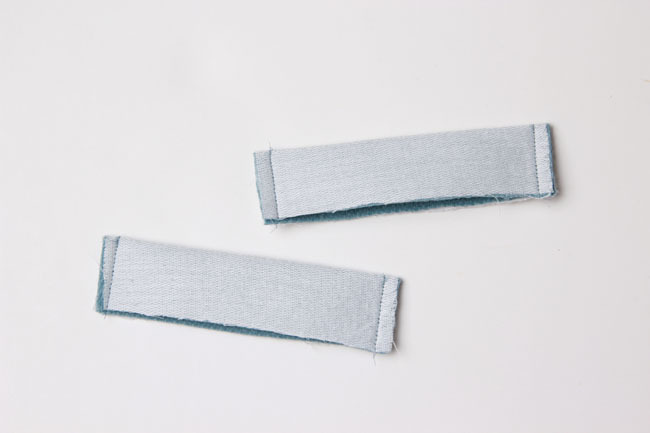 Clip the upper corners of the welt. Turn welts right side out and press. 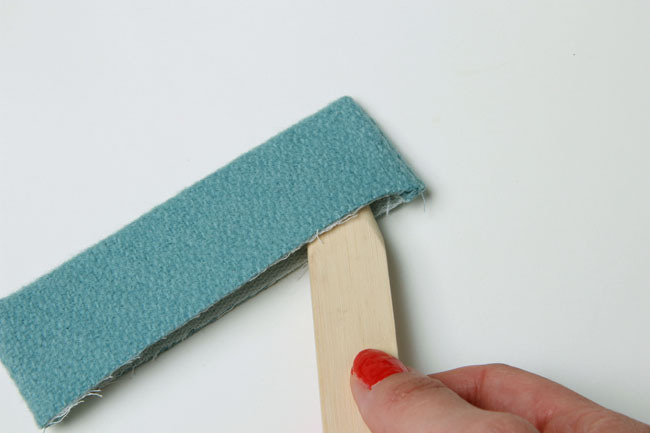 A point turner can be helpful here for pushing out the corners. Using a contrasting thread color, baste a line 1/2” from the raw edge. This will act as your stitching guide later. 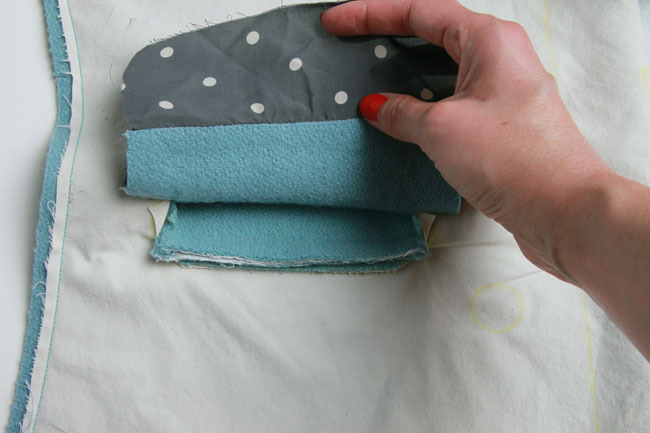 With right sides facing up, place a pocket underlay (J) on top of each lower pocket (K), with the top edges aligned. 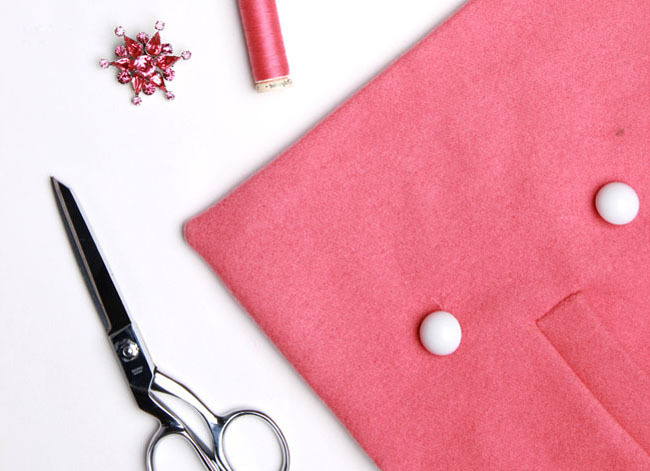 Using a contrasting thread color, baste the pieces together along the upper edge with a 1/4” seam allowance. This will act as a stitching guide later. 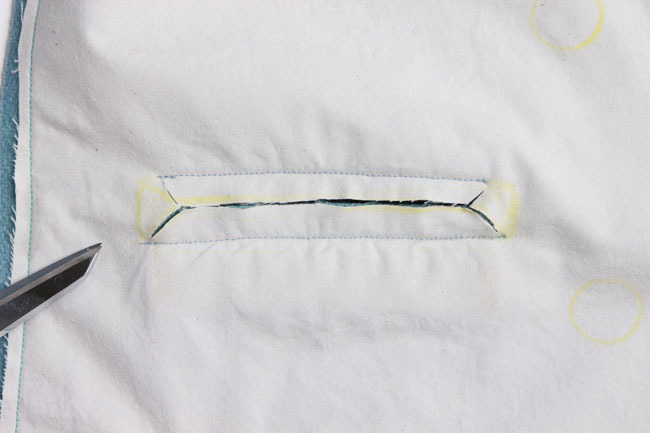 Change back to a matching thread and zigzag the bottom edge of the pocket underlay (J) to the lower pocket (K). 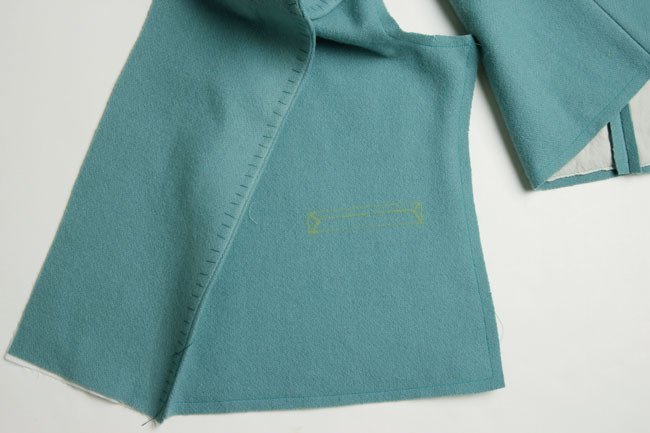 Transfer the marking for the welt pocket onto the right side of the jacket front (A). Open the facing away from the jacket. 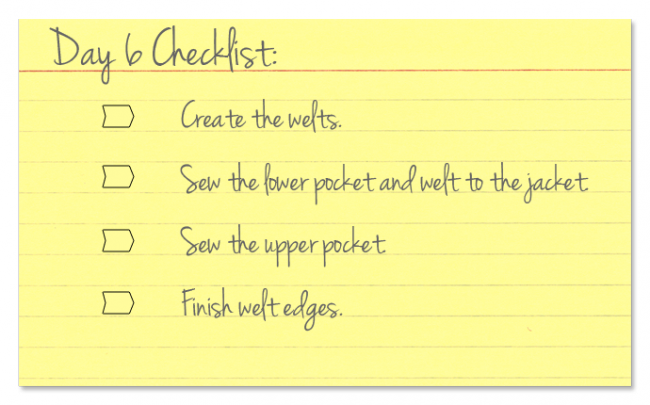 You will be applying the welt pocket only to the jacket front (A), and not stitching through the facing. Lay the welt (I) on the marked lines for the pocket placement on the jacket front (A). Place the welt on the bottom, with the raw edge along the center line. 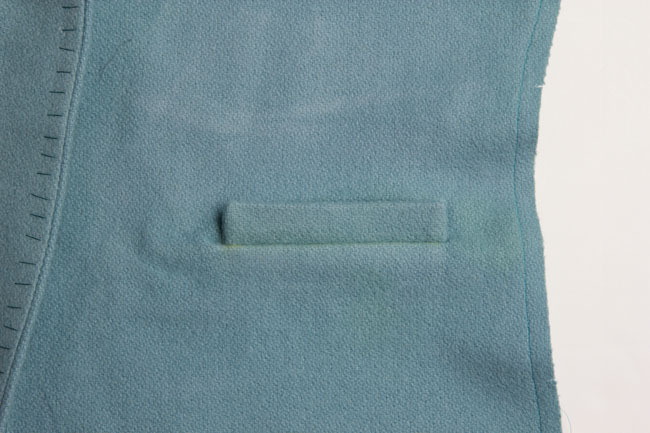 With underlay facing toward the jacket, place the lower pocket (K) at the top of the pocket placement mark, with the raw edge along the center line. Pin pieces in place. Stitch the welt (I) in place along the contrasting stitching line, beginning and ending stitching exactly at the edges of the welt. Stitch the lower pocket (K) in place along the contrasting stitching line. 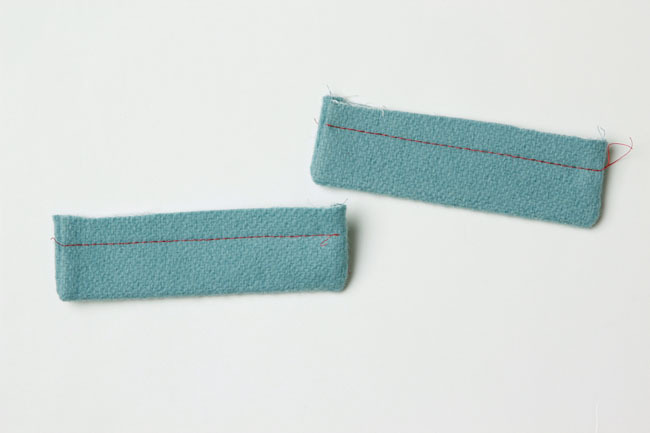 Begin and end stitching just slightly short of welt edges by a scant 1/8”. Remove the contrasting basting stitches. On the wrong side of the jacket front (A), slash the pocket through the marked center line, stopping 1/2” from the end of the pocket. At each end, clip diagonally toward the corners in a Y shape. Be very careful not to cut through the stitching lines. 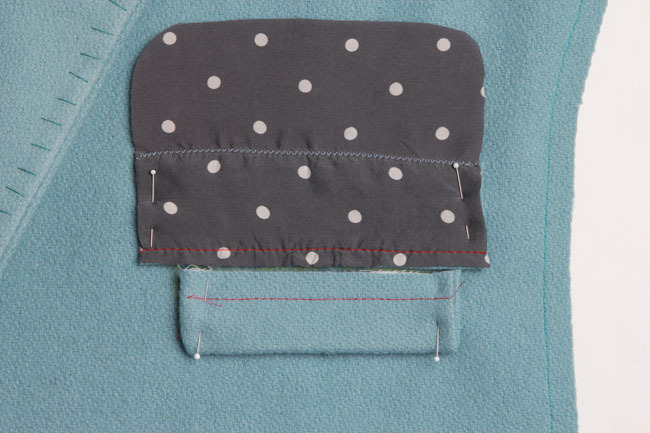 Turn the lower pocket (K) to the inside through the slash and adjust the seams to lay flat. Press from this side, then press again from the right side. Turn the welt up, pushing the welt seam allowance through the slash. Press flat. On the inside of the jacket, flip the lower pocket (K) up, revealing the right side. 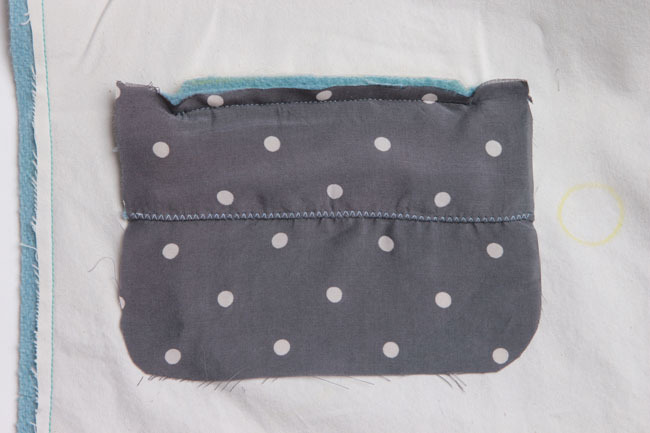 Lay the upper pocket (L) on top of the lower pocket (K), with right sides together. 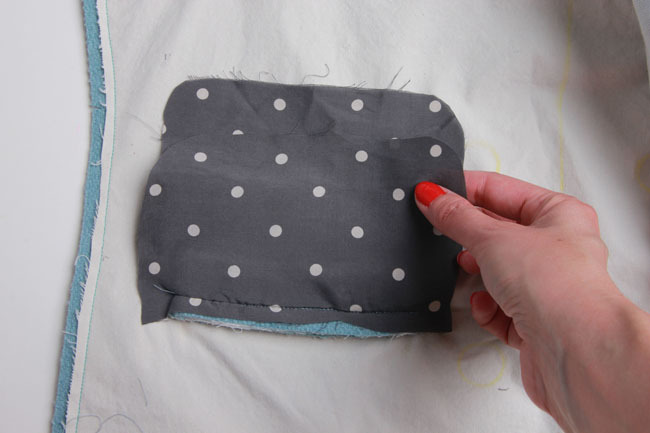 Align the top edge of the upper pocket with the raw edge of the welt (I). Stitch the upper pocket (K) to the welt (I) along the stitching line. Stitch only to the welt, and not through the garment. Fold back the jacket front (A) to expose the triangles. Stitch the triangles to the pocket underlay (J) to secure the corners, backstitching over them a few times. 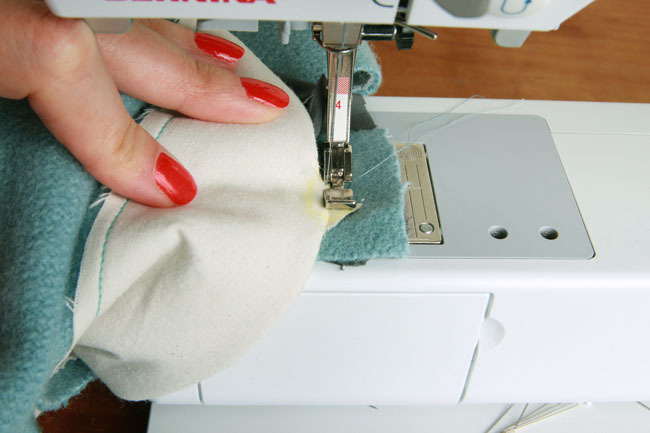 Use a zipper foot to get close to the base of the triangle. 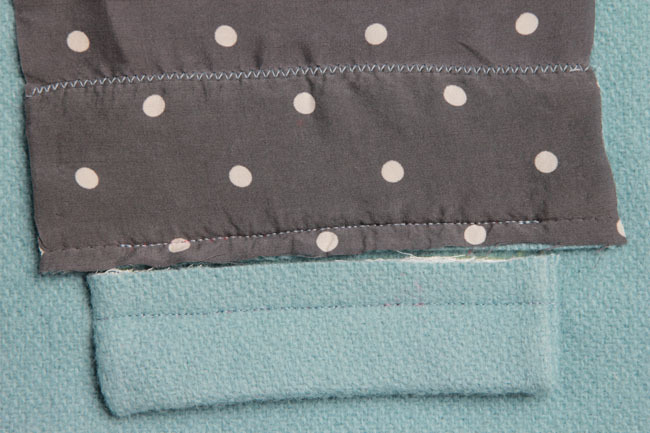 Stitch the lower pocket / underlay unit to the upper pocket (K) around the remaining edges. 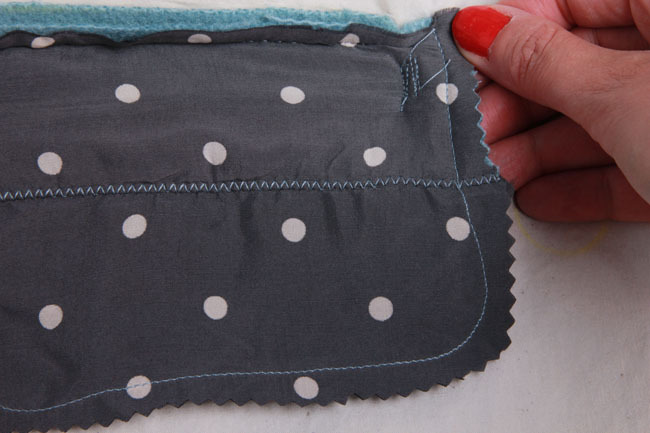 Finish the edges of the pocket to prevent raveling. 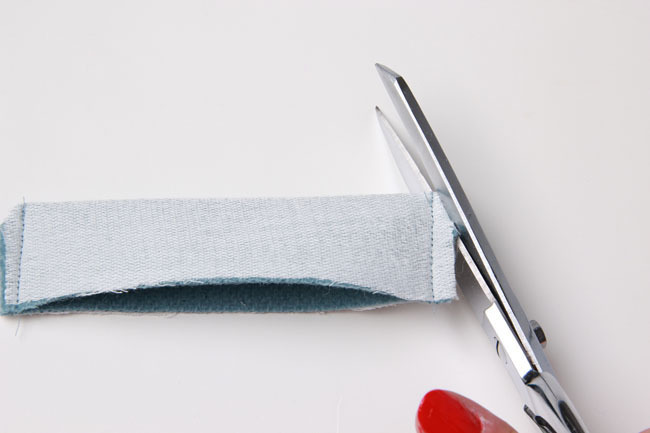 I like to do this using pinking shears, because it does not add any bulk to the pockets. 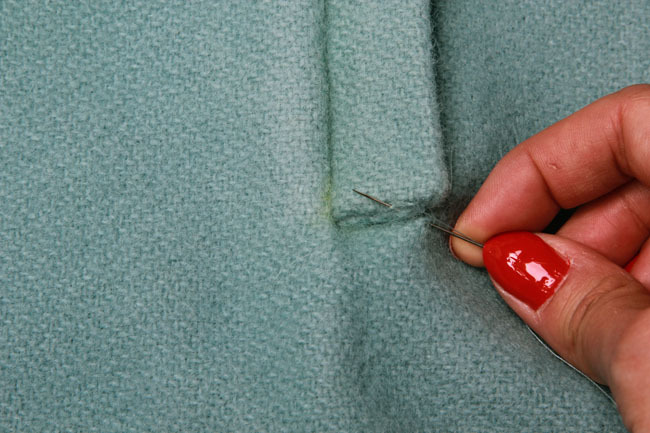 On the outside of the garment, hand stitch the short edges of the welt to the jacket using a fell stitch. And the welt pockets are done! Feeling good? You should, because your jacket is getting close to being done. Next week, we’re going to cover the final two lessons. On Tuesday, we’ll put in the sleeves. Then on Thursday, we’ll line our jacket and finish it up. Thank you for such fantastic tutorial, it seems taking the bound button holes a step further!!! Can’t hardly wait to finish my Anise! Is there any benefit to making the welt pockets before sewing the front pieces onto the jacket and doing all the interfacing? Then it would be much easier to handle the pieces when putting the welts in. 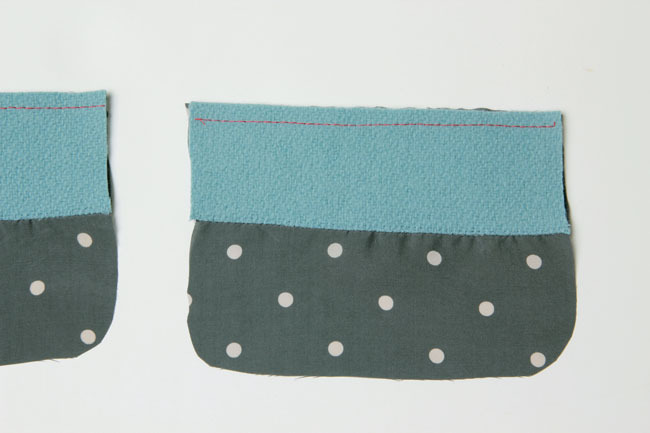 Or is it perhaps more difficult to make sure the pockets are even on both sides this way? You can do either, but I find it’s easiest to do welt pockets on smaller pieces, i.e. the jacket fronts before they’re sewn to anything else. It’s also easier to mark their placement accurately this way. So it’s the same reason a lot of people like to do buttonholes first. But really, if you want to switch the order, it’s whatever works and feels easiest!